Teams of University of Washington students have been working throughout this academic year on livability and sustainability projects in the City of Auburn. The yearlong Livable City Year partnership has given students a chance to work on real-world challenges identified by Auburn, while providing Auburn with tens of thousands of hours of study and student work. 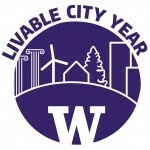 Livable City Year connects UW faculty with projects based in Auburn, which are then incorporated into their classes. The program started this year, partnering with Auburn for the 2016-2017 year. This fall marked the first quarter for the program, when students in seven courses tackled 10 separate projects. The final reports from these projects are now complete. Students in Livable City Year courses spend at least one quarter working on a specific project identified as a need by Auburn. The student teams work with Auburn staff and community stakeholders as they conduct research and work on the projects. Fall projects included assessments of Auburn’s work in reducing homelessness among the community, educational strategies to reduce pet waste and improper household items in wastewater, cultural city mapping, city values outreach, work on community place-making, and more. After the quarter’s research work is completed, a student or student team works with Livable City Year’s editor and graphic designer to prepare a final report for the city, including any recommendations or possible future steps. By having several coordinated student teams across disciplines working on various projects, the Livable City Year program provides the City of Auburn with ways to enhance sustainability and livability elements within existing and future projects and programs. 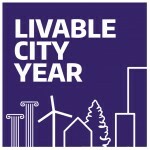 The UW’s Livable City Year program is led by faculty directors Branden Born with the Department of Urban Design and Planning and Jennifer Otten with the School of Public Health, in collaboration with UW Sustainability, Urban@UW and the Association of Washington Cities, and with foundational support from the College of Built Environments and Undergraduate Academic Affairs. While the fall project teams have completed their reports, this winter students have been working on projects including reducing food waste in school cafeterias; researching the costs, challenges and benefits of low-impact development stormwater technology; and better connecting Auburn’s residents socially, culturally, and economically. Senior Ariel Delos Santos was one of the students in Born’s fall class which looked at connectivity and community place-making in Auburn. For more information, contact Born at bborn@uw.edu or 206-543-4975; LCY program manager Jennifer Davison at jnfrdvsn@uw.edu or 206-240-6903; and Jenna Leonard, Auburn’s climate and sustainability practice leader, at jleonard@auburnwa.gov or 253-804-5092.